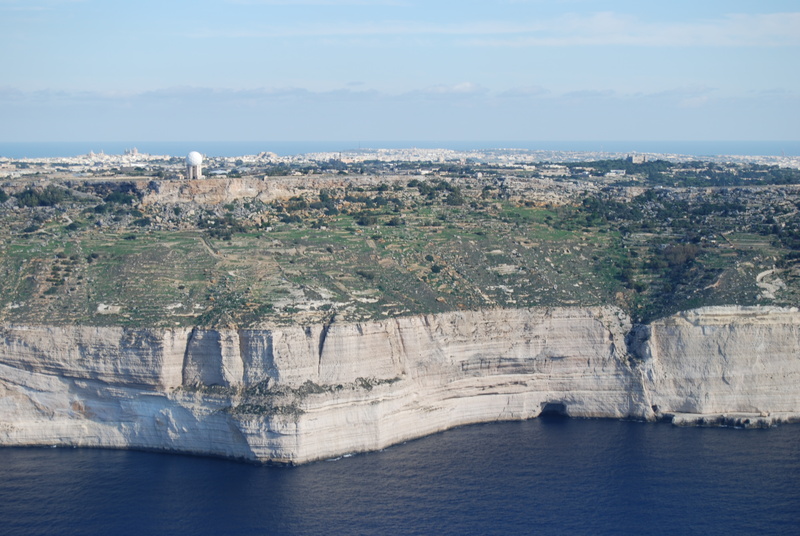 The Maltese Islands are made up of horizontally layered marine sedimentary rocks. The geological lithology is lime-rich and many skeletal remains of calcium carbonate material, such as shell fragments are found. The total layered rock sequence, characterised by five strata can be viewed from Dingli Cliffs, distinguishing the plunging vertical rock faces of the Coralline Limestones from the gentle topographies of the Globigerina Limestone and Blue Clay. Lower Coralline Limestone (Zonqor) – the oldest exposed rock at the Maltese Islands (30-25 million years) forms the base of the Dingli cliff section. Being the most crystalline, the Lower Coralline Limestone is resistant to erosion. The large number of fossils, including snail casts of the Conus species and coral (Meandrina species) indicate that this layer was formed in shallow marine settings. Globigerina Limestone (Franka) – the yellow to pale grey limestones of the Globigerina overly the Lower Coralline Limestone forming gentle slopes such as the lower cliffs at Dingli. Two typical fossils dating 30-25 million years, that can be found within the Globigerina Limestone are the Sea Urchin (Rizza tal-Hama, Echinolampas lucae) and the Sand Urchin (Saqajn ix-Xitan, Schizaster parkinsoni). Blue Clay (Tafli) – the talus slopes of the Blue Clay lithology make up some of the farmed agricultural holdings at the cliffs. The blue clay consists of fine lime grains and kaolinite, a clay mineral, which make the layer compact when dry and plastic upon wetting by rain water. The impermeability (restricts water flow through) of the Blue Clay is crucial for the development of the preced aquifers and it acts as a storage of freshwater. Greensands (Gebla s-Safra) – is a thin layer (less than 1m) which attains its orange colour from oxidisation and exposure to air. Fossils of the Domed Sand-Dollar (Rizza tar-Ramel, Clypeaster altus), dating 15 -15 millions years are found in the Greensands formation. Upper Coralline Limestone (Qawwi ta’ Fuq) – the youngest and topmost layer, which forms the plateau of the cliff section. This layer is similar to the Lower Coralline Limestone in composition, having numerous fossil algae species. The highest ridge of the Maltese Islands at 253m elevation from sea level is reached at Ta’ Dmejrek, about 2km from THE CLIFFS Interpretation Centre. Coral fossils (Qroll), found in the Upper Coralline lithology date 15-10 million years and their globular shape is distinct from other species.